Last Monday I met Tyler Schmidt at Lake Lanier just before sunrise to get information for a November Georgia Outdoor News article. He showed me ten good places to catch big spotted bass on the lake during November, which baits to use and how to fish them. We ran to a rocky point and, on my very first cast with a topwater plug, a fish sucked it under. The fish fought hard and I said it might be a striper or hybrid, but it was fighting more like a spotted bass. It was big and I let it fight against the rod and the 12 pound line I was using. When it got almost to the boat, just before we could see it in the clear water, it made a couple of strong runs, stripping drag. Then my line went slack. I said I could not think of anything I did wrong, I guessed it was one of those fish that was just meant to get away. When I reeled in my Whopper Plopper plug the front treble hooks were gone. The fish had straightened out the split ring holding them to the plug, something I have never had happen to me. I was disgusted. When I got home I posted a picture of the plug on Facebook and told the story of what happened. Several fishermen, a couple of them pros, said the hooks and split rings on that plug were sorry and you should immediately change them to stronger hardware before fishing the plug. Those plugs cost between $15 and $20 and it is ridiculous they don’t put good hardware on them. At Martin I landed about 15 bass on that plug and never had a problem, but all those fish weighed less than two pounds. I was impressed how sharp the hooks were. Usually when I hooked a fish it would have one set of trebles in its mouth and the other set would have stuck into is further back, a sign of very sharp hooks. But is does not matter how sharp the hooks are if the split ring holding them to the plug opens up! Another plug, the Rat-l-Trap, are notorious for having bad hooks. They don’t straighten out, they just are not very sharp and are hard to sharpen. For years I have replace those hooks, but the plug costs $6.95 at Berry’s Sporting Goods! The rest of the day We fished the places he put on the map and saw a lot of schooling fish, and caught some weighing about two pounds each, but nothing big. My biggest spot is a 4.4 pounder I caught in a tournament at Lanier last fall about this time. The fish I lost fought harder so if it was a spot it was a big one! But I almost hope it was a striper. The guides at Lanier are posting pictures on Facebook of big spots they are catching right now, many on topwater plugs. They are also catching a lot of stripers. If you can stand the traffic a trip to Lanier would be great right now. On Monday I left home at 5:40 and was a little surprised how much traffic was headed north that time of night. Georgia 20 was not bad and I 75 and 675 were busy but not crazy. But when I got on I 285 headed north, it was ridiculous. It was bumper to bumper at speeds less than 30 MPH all the way to I-85. And I was not even puling a boat. The traffic is why I don’t go to Lanier more often. Its no wonder that more folks that have to drive in that every day seem so on edge and nervous all the time! It would drive me crazy. These Map of the Month articles have been put into eBook format – one article for each month of the year, giving you 120 spots to fish! A book for Lanier and one for Clarks Hill are available. This entry was posted in Bass Fishing, Where To Fish on October 27, 2016 by ronniegarrison. When fall crappies and sunfish roam deep weed edges and structural sweet spots such as points and bars, fishermen adept at precisely positioning subtle presentations in front of fish’s noses can enjoy banner catches other anglers miss. One of the best ways to reap the autumn harvest—and indeed, catch panfish anytime they favor deep habitat—is working a small jig on a modified three-way rig similar to those used by walleye anglers. It’s a simple yet deadly setup. You’ll want to keep the jig in or close to the sonar cone, so leave the long rods in the locker. I favor a 6′-3″ medium-light spinning rod such as 13 Fishing’s Muse Gold (http://www.13fishing.com/muse-gold/), strung with 6-pound Bionic Braid (https://shop.northlandtackle.com/line/bionic-walleye-braid/). Tie a three-way swivel to the end of the mainline, then add a relatively long dropper (say, 24 inches) of 4-pound BIONIC mono. A 3/16- to ¼-ounce dropshot weight should do the trick on the tag end. Tip: By adjusting the weight’s location on the dropper, you can raise or lower the jig in the water column to position it slightly above the level of the panfish. Tie a 12- to 16-inch tagline of similar 4-pound mono to the swivel’s trailing eye, then add a small jig. Northland Tackle’s Helium Stonefly (https://shop.northlandtackle.com/seasonal-tackle/ice-fishing/impulse-helium-stonefly/) is my favorite choice, but any of the neutrally buoyant Helium Series heads work fine. Don’t worry about adding meat. The IMPULSE body adds all the scent and animation you’ll need. Armed with this rig, you can inch your way along weed edges and breaklines, or hover over a school of fish. Either way, keep rod motions to a minimum. The jig and softbait’s natural subtle action is perfect for panfish that typically aren’t overly aggressive and not inclined to chase down prey. The light jig is easy for fish to inhale, and you typically don’t feel the fish until it turns to swim away with your lure. When you feel a light tug, execute a gentle, sweeping hookset and chances are good you’ll be firmly hooked up to another fat fall panfish. This entry was posted in Bream Fishing on October 26, 2016 by ronniegarrison. Gun deer season opened Saturday in Georgia. If you were out before daylight you saw trucks and SUVs, many pulling trailers with 4-wheelers on them, headed south toward favorite hunting places. Every one of those vehicles had a high powered rifle or shotgun in it. Many were the dreaded “semiautomatic” type. There were guns everywhere and no problems. There are about 320,000 deer hunters in Georgia. We have a gun season that lasts 85 days. Last year, with all those guns in the woods all those days, there were only 20 accidents involving firearms, and as far as I can tell no one was shot on purpose. Compare that to Chicago, where guns are pretty much impossible to own legally. If Chicago could go 85 days with only 20 gun accidents, none of them intentional shootings, it would be a miracle. Guns are not the problem. As far as the hunting, whiteoak acorns have been falling like rain for the last week. I don’t like that, they started falling a week too soon for me. If they had started falling this weekend the deer would be moving, looking for a place where there were a lot of acorns. By now they have found the motherlode of their favorite food and won’t move far from it. I have a hillside with a lot of whiteoak trees on it so that is where I hunt when the acorns are falling. Hopefully some deer decided it was a good place to feed and I now have some fresh meat in the freezer. That is a little unlikely since doe days don’t start where I hunt until November. I prefer shooting does, they are easier to clean and seem to taste a little better, but I will have to wait a couple of weeks for that to be legal. This entry was posted in Guns and Gun Control, Hunting on October 25, 2016 by ronniegarrison. Shorter days and yellowing leaves are about the only ways you can tell it is late September. Temperature wise, it feels like August lasted six plus weeks. Although the lingering summer has worn out its welcome, there is a silver lining. The peak of the topwater bite for stream smallmouth bass is just beginning, not winding down. “I’ve fished Barren River the last two weekends and absolutely waylaid them on a buzzbait,” Baker said. “We caught two over 18 inches long this past weekend. I feel confident throwing topwaters on streams for smallmouth bass until the temperatures drop all the way down into the low 60s.” Daytime water temperatures on central Kentucky’s Elkhorn Creek ranged in the low to mid-80s this past week. Early fall creates optimum feeding conditions for stream smallmouths, putting them on the prowl and turning them more aggressive. “We are in the best time of the year for food resources on streams, and the smallmouth bass take advantage and feed heavily,” Baker said. Baker goes big with his topwater presentations in early fall, flying in the face of stream smallmouth orthodoxy that dictates small lures with subtle actions. Walking baits such as the Zara Spook or Puppy, designed for the “walk the dog” retrieve work well fished over the shallow, shady side of the creek now. Walking baits move side-to-side by gently jerking the rod tip from one side to another. Stream smallmouth can’t stand this retrieve and often hit walking baits with tremendous aggression in early fall. The best colors are bone, silver plate (chrome) and flitter shad. This also applies to the other topwater hotspot in early fall: the deeper pockets and eddies just above a riffle. Those with logs, large rocks or undercut banks nearby produce best. Avoid fishing topwater lures in the sections of the stream with the strongest current. From the riffle area, cast chugger or popper-style topwater baits, such as the Chug Bug, Pop-R or Skitter Pop, upstream of the eddy, log, undercut bank or rock. Gently jerk the rod with the rod tip down to make the convex face of the lure pop and splash water. Don’t over work a chugger for stream smallmouth. Topwater propeller baits such as the Baby Torpedo or a floating/diving minnow lure also work well in this situation. When the light dims at dusk to the point where it is hard see well enough to tie on one last lure for the day, choose a black 1/8-ounce Jitterbug. Cast it above stream drops at a 45-degree angle and retrieve it just fast enough to make the lure gurgle. Smallmouths sometimes just sip it from the surface or hit with a force that leaves you shaking. To find a good smallmouth bass stream near you, visit the Kentucky Fish and Wildlife website at www.fw.ky.gov. Click on the “Fish” tab, then “Recreational Fishing” tab for a wealth of information about smallmouth streams in Kentucky, including access points, stream fisheries information and paddling opportunities on streams with good smallmouth bass populations. Author Lee McClellan is a nationally award-winning associate editor for Kentucky Afield magazine, the official publication of the Kentucky Department of Fish and Wildlife Resources. He is a life-long hunter and angler, with a passion for smallmouth bass fishing. This entry was posted in Bass Fishing, River Fishing on October 24, 2016 by ronniegarrison. 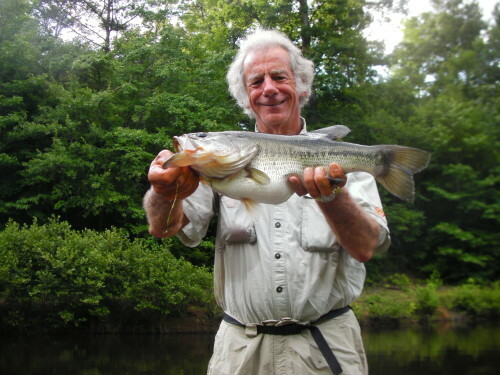 The articles for this series of books, Keys to Catching Georgia Bass, were written over a span of 15 years. Conditions change but bass tend to follow patterns year after year. For example, Clarks Hill has gone through a series of years with low water then full again. After a couple of years of low water, grass and bushes grow that will be flooded in shallow water when the lake fills. But after a few years that cover rots away. Bass will still be in the same areas, you just have to fish the cover in them that is available when you fish. Some years the water is clear and some years stained to muddy during the same months. The patterns and places in these articles will still work, but you may need to adjust the color of the bait to the conditions. New baits and tackle companies come along every year but you can always find old favorite baits or similar baits from a new company that were produced by a defunct company, or use the new ones that are similar in action. The GPS Coordinates given for each spot will get you very close to what you want to fish. An old brush pile on the coordinates may be gone, but you can bet another one will be in the same place or very nearby. Some spots are on more than one map for more than one month. You can bet that is a good spot, if more than one good fisherman chose it! Some spots are good year round, over many months. The eBook is $4.99. I may have some copies printed but the price would be about $10.00. If you want a printed copy please email me at ronnie@fishing-about.com to reserve a copy if I do have them printed. This entry was posted in Bass Fishing, Book Reviews, Fishing Information, Fishing Ramblings - My Fishing Blog on October 24, 2016 by ronniegarrison. The second Saturday in September nine members of the Potato Creek Bassmasters fished our September tournament at Bartletts Ferry Lake. After fishing from 6:00 AM until 1:30 PM we brought 34 keeper bass to the scales. There were two limits and everyone caught at least one keeper. Most of them were spotted bass. Niles Murray was in a hurry to go shoot doves but he still managed to land five keepers weighing 7.53 pounds for first. Kwong Yu had four weighing 6.92 for second, Raymond English had five at 6.66 for third and Mike Cox was fourth with four at 5.05 pounds. Frank Anderson had big fish with a 3.82 pounder. I started on a gravel bank and caught two on a spinnerbait before it got light enough to see to measure them. As it got light enough to see, at about 7:00 I caught a keeper largemouth on a jig and pig. That gave me three in the livewell the first hour which I thought was a pretty good start. Although I fished a lot of different kinds of places and used a lot of different baits, when we weighed in at 1:30 I had four keepers. I landed my biggest fish, a two pound largemouth, from some brush at noon on a jig head worm. That was it and my 4.5 pounds was not good enough for a top four finish. This entry was posted in Bass Fishing, Tournament Fishing on October 23, 2016 by ronniegarrison. Several people got on me about saying I didn’t hear any shooting on opening day of deer season. They pointed out it was bow season. They are right, I had forgotten bow hunters almost always use string silencers nowadays. Ticks are terrible again this year. I get bit just going out in my back yard and picking tomatoes. If you are bow hunting or scouting for gun season you need to be very careful. Don’t go out without spraying with a good repellant. Although the CDC says there are almost no cases of Lyme Disease in Georgia each year, a blood test showed I had it about seven or eight years aqo, and every time I mention it someone says they have been tested positive or know someone who has. Lyme disease is a bacterial infection ticks transfer from one host to another. It is supposed to be cured with a round of antibiotics but some doctors say there is kind of chronic Lyme Disease that is very hard to cure. I was sick for over a year, taking round after round of antibiotics, and ended up going to Mobile, Alabama to a doctor that specialized in it. Growing up we almost never saw a tick, and I don’t think I ever got one on me. But the spread of deer spread ticks, too. Now they are all too common. About 20 years ago I took some ticks I had captured on sticky tape to an entomologists at the Experiment Station and got information on them. When a female tick lays its eggs there may be several hundred laid in one spot. When those eggs hatch the tiny larvae crawl up a piece of grass or weed and wait on a host. It can be a mouse, squirrel, deer or you. At this stage the ticks are smaller than a pin head and hard to see. When they bite you or another host they drop off almost immediately. Since you don’t get the itch from the bite for a day or so they are long gone by the time you know you have been bitten. After their blood meal they go into the ground and molt, coming back out bigger. If the host they bit the first time had Lyme Disese in its blood the tick can now infect you. The small tick climbs back up on something and waits on another host. This time it may be attached for a few hours before dropping off, but are again usually long gone when you know you have been bitten. They are still so small you won’t feel them crawling on you and they are still very hard to see. Since they are more scattered now, depending on where they dropped off, you will have fewer bites. At the first stage you may get dozens at one time. Again they go into the ground and molt, coming back out bigger. This time you may feel them crawling on you and they stay attached a day or so and is at what we often call seed tick stage. After they drop off the females will breed then get one more blood meal, this time filling up with blood to the big gray stage we often find on dogs. This takes several days. Than the female, full of blood, drops off, digs into the ground, and lays her eggs, starting the cycle again. If you find an attached tick get it off and watch the bite to make sure you don’t get the red, infected “bulls eye” typical of Lyme Disease. Even without that sign if you start feeling bad, like you are getting the flu, run down and slight fever, insist on being checked for Lyme Disease if it does not get worse fast like the flu does. By the way, you don’t have to go hunting and it does not have to be in the fall to get it. I am almost positive I got infected at West Point Lake. After a bathroom break in the woods in April I found three ticks on me, and started feeling bad in late May or early June that year. This entry was posted in Hunting on October 21, 2016 by ronniegarrison. Bassmaster revealed recently that they will allow 10-foot rods in tournament boats next year, up from the 8-foot maximum that has been the standard forever. A lot of anglers might ask what the heck any bass fisherman would want with a rod that long, when most of us never use anything bigger than about 7’6″, but there apparently is a demand for the monster sticks among some of the top Elite pros. The advantages are in two areas–for flippin’, the short game of bass fishing, the longer rod gives a better angle to reach distant teacup-sized potholes, and also the potential power of these bigger rods will give anglers a better chance of derricking a big fish wrapped in 20 pounds of weeds to the boat. The rods will also add some real potential distance, for those who master them, to crankbait fishing. The longer the rod, the longer the potential cast, and as most who enjoy crankbait fishing know, the farther you throw them, the deeper they go on retrieve. Since success with a crankbait often depends on grinding it along a gravel or shell bottom, being able to get a lure down there and keep it there throughout a long retrieve is going to have a big impact on the catches. Of course, being able to handle the increase in tip speed of the rod and spool speed of the reel will be key, and it’s going to take a period of adjustment for most to get used to the big difference in the weight and balance of the longer rods. The backlashes likely will be monumental early on. There will also be issues with storing the rods on nearly all bass boats, unless they’re made to be collapsible, as some flippin-sticks are already. The tubes on most boats max out at 8 feet, even on the largest rigs, and many boats under 20 feet long can’t handle anything over 7’6″. There’s also the issue of keeping the hooks out of the angler on the other end of the boat, in team tournaments and during fun fishing with family. A 10-foot rod has the potential to reach all the way across the back deck of most boats if the bow angler does not watch his backcast. And when a burly angler up front powers up to cast a 10XD a mile, those big treble hooks are coming at speeds that just about break the sound barrier. It won’t be pretty when somebody gets stuck. That said, increasing the legal rod length will be a shot in the arm for the tackle business in the coming year. Not only will all the pro’s have to have several of the new sticks, all of us wanna-be’s will also need a couple if we want to be at all similar to KVD or G-Man, and they’re probably not going to be cheap. Look for reel makers to jump on the train and make special reels for these rods, as well. In short, there’s not much new under the sun when it comes to bass angling these days, but the addition of these new mega-rods will probably spark plenty of interest over the next few months among those who live and breathe tournament bass angling. This entry was posted in Bass Fishing, Fishing Tackle on October 20, 2016 by ronniegarrison. Recently I was talking with Kenny DeLay about carp. He shoots them with his bow, and has a boat set up for going after them. He asked me if I ever ate one. That went right along with an article I read recently about using every part of a deer you shoot. I grew up on a farm and we wasted nothing. The old saying about using everything about a pig except its squeal was applied to our living. From that it is hard for me to throw out anything edible, even if it seems strange to some. Back in the mid-1980s I was at our place at Raysville Boat Club on Clarks Hill, camping in my small trailer. Mom and dad were staying on the other side of the point in their mobile home. I was off for the summer so I put out sinking catfish food under our boat docks every day, hoping to get some catfish baited up. One day about noon I was walking from the bath house past the docks and saw my mom fishing under them. She was sitting in her chair and reared back on her rod and Zebco reel, fighting something big. I went to help and netted a six pound carp for her. Since we considered them trash fish and considered them inedible because of all the little bones, we threw it back and mom went back to catching bream and trying for catfish to fry. That night I got to thinking about the carp coming to the catfish food. I found a can of kernel corn, something I heard they liked, and got one of my light spinning rods rigged with a small hook. I had been under the dock only a few minutes when something hit my corn and took off. It turned out to be another six pound carp. I caught three more that night before going to bed. The next morning I got mom and dad to fish with me and we started catching carp. Although I think we lost more than we landed, during the next three days we caught 37 weighing 157 pounds. We didn’t want all the carp in the lake so we threw them in the bottom of our run-about tied under the dock. The first afternoon dad went to a nearby marina to get some hooks and a guy there told him how to cook carp. We fileted all those carp and put the chunks of meat in pint jars with a teaspoon of salt and a teaspoon of oil. Mom then put them in the pressure cooker at 15 pounds for 90 minutes. The jars sealed when they cooled. when mixed with spices and fried. I ate many meals of them over the years. A few years ago Hovie Smith and I were at an outdoor writers meeting at Lake Eufaula. I took him out bow fishing and he shot a gar. I had never eaten one but he said he would show me how to clean it and cook it. Hovie took tin snips and cut up the middle of the back, then peeled out the meat along both sides of the backbone. It was like taking out the back straps of a deer. There was a round piece of meat about 18 inches long and and two inches in diameter. I cut the meat into two inch long chunks and sautéed it in butter. It was good and reminded me of Florida Lobster. The meat had that musky flavor and was a little chewy, but good. It is way too much trouble to clean a gar that way but I found a much easier way. A few years ago I saw a jug moving around in the middle of Germany Creek in the middle of the day. It had a four foot gar on it and I took it in. After killing it I gutted it and took a hacksaw and cut its body into one foot chunks. That night after grilling a steak I put the chunks on the grill, covered it and left it for about an hour. When I took it off the armor-plated skin peeled right off and the meat was warm and good when dipped into melted butter! As I said, we never threw any food away. My mom could cook and old boot and make it taste good, so imagine how good regular food tasted. But we did go to extremes. After a dove shoot some folks pop the breast out and throw the rest of the bird away. We cooked it all, to the point of saving the tiny hearts and livers to make giblet gravy to go with the fried birds. We would even take the little gizzard, split it and clean it out to add to the gravy. I am careful shooting deer to try not to hit the heart or liver. I enjoy slicing them both and frying with onions, then making rich brown gravy. The liver is easy to clean, all you have to do is cut out the white connective tissue and the big blood vessels at the base of it. The heart takes a little more time since you have to take out the valves from all four chambers, but I think it is worth it. I ate beef tongue one time and it was good. A recent magazine article told how to take out a deer tongue and clean and cook it. That will be my new meat for this year when I kill a deer. This entry was posted in Fish Recipes on October 19, 2016 by ronniegarrison. Does Stocking Largemouth Bass Help? HOT SPRINGS – Fisheries biologists with Arkansas Game and Fish Commission are always interested in evaluating how stocking programs are working in the many waterways of The Natural State, all while working to get the agency, the resource, and the people of Arkansas a good return on its investment. One way AGFC hatcheries are improving both largemouth and Florida bass production is by rearing advanced fingerlings to stock in area lakes. In the past, hatchery staff have reared bass to fingerling size, about 1½ to 2 inches, and released them in lakes in AGFC’s stocking program. Hatchery staff have been researching and evaluating different techniques to rear bass to approximately 4 inches for a pilot study. When these advanced fingerlings reach about 4 inches, they are branded with liquid nitrogen to create an identifiable mark and then taken to study lakes as part of an ongoing research project with the AGFC Black Bass Program. A pilot study for rearing 4-inch advanced fingerlings is underway for largemouth and Florida bass at multiple AGFC fish culture facilities. At these culture facilities hatchery staff are evaluating how different feeding regimes and food sources affect the growth rate of bass fingerlings. With the assistance of the hatchery staff working to increase the size of stocked bass biologists hope to increase the survival rate of stocked fish against bigger bass and other predators within the system. A larger fish, in theory, has a better chance of survival. Fendley says it’s not just a matter of food. Jeff Buckingham, AGFC Black Bass Program biologist, has designed a pilot study for the program to evaluate the stocking contribution of the stocked branded fish in selected study lakes. “Biologists will start sampling the study lakes approximately one month after stocking,” Buckingham said. “Bass will be collected and examined for the identifying brand, add an additional identifying mark, and then release them back into the lake. The additional identification mark will serve to identify fish that have already been collected at least once during sampling to avoid those fish being counted more than once in the study. Sampling will continue until the spring approximately every 30 days to search for branded fish in the study lakes. “During sampling if we collect and release 100 bass from a study lake and 10 have a brand then that’s a 10 percent survival rate. If it’s 20 fish? That’s even better,” Buckingham said. “The overall goal is to provide a bigger bang for our buck for both the resource and the people of Arkansas. Sampling data of the study lakes stocked with the 4-inch advanced fingerlings will also be shared with AGFC fisheries pathologist. Ongoing genetic testing of bass fin clips will provide agency staff a better evaluation of the success rate of Florida bass stockings and how Florida bass coexist with native largemouth bass in Arkansas lakes such as Millwood, DeGray, Ouachita, Columbia, Chicot, Atkins and SWEPCO. Dennis says there are a lot of moving parts in the pilot study, and will take a combined effort of hatchery staff and field biologists to pull it off. The branded advanced fingerlings are being stocked in different study lakes around the state. Branded Largemouth Bass in the study are being stocked into Lake Frierson and Craighead Forest Lake, while branded Florida Bass are being stocked into Gurdon Lake and Dr. Lester Sitzes III Bois D’Arc Lake. This entry was posted in Bass Fishing, Conservation on October 18, 2016 by ronniegarrison.